Explanation: Have you ever seen the Man in the Moon? This common question plays on the ability of humans to see pareidolia -- imagining familiar icons where they don't actually exist. 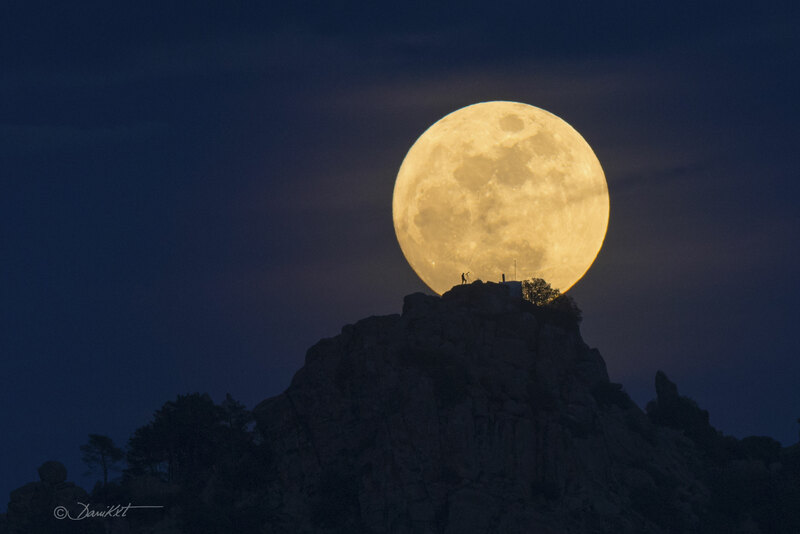 The textured surface of Earth's full Moon is home to numerous identifications of iconic objects, not only in modern western culture but in world folklore throughout history. Examples, typically dependent on the Moon's perceived orientation, include the Woman in the Moon and the Rabbit in the Moon. One facial outline commonly identified as the Man in the Moon starts by imagining the two dark circular areas -- lunar maria -- here just above the Moon's center, to be the eyes. Surprisingly, there actually is a man in this Moon image -- a close look will reveal a real person -- with a telescope -- silhouetted against the Moon. This featured well-planned image was taken in mid-January in Cadalso de los Vidrios in Madrid, Spain. Do you have a favorite object that you see in the Moon?